to the people of Hiroshima expressing her hope for world peace in the future. Once a year, just before August 6, the world remembers Hiroshima. Journalists swarm in looking for reassuring stories of a rebuilt, prosperous city or for accounts of continuing despair, depending on their individual or ideological bias. Political groups descend to hold "peace" rallies in front of the Memorial to the Dead. Hundreds of tourists come. The rest of the year, the Hibakusha (those who were exposed to the atomic bombs) are a group apart. In their own cities of Hiroshima and Nagasaki, they are misunderstood and neglected. In other parts of Japan they are even more alone. If they try to warn the world or to ask for special understanding or help, everyone unites to silence them. Their own people have rejected them, made political capital of their tragedy, evicted them from their bombed-out land, profited from tourism to their city (without making any effort to help visitors understand their feelings or to enable the handicapped to benefit from the tourist dollar), scoffed at their fears and their claims of continued suffering from radiation effects-and then turned right around and discriminated against them in jobs and in marriage arrangements because of the health and genetic risks inherent in having been exposed to the "ashes of death." People of other countries have used Hiroshima as a symbol but have done little for the sufferers as individuals, human being who need the moral support and understanding that could make their sacrifice meaningful even more than they need the cold comfort of charity or government aid. And nations everywhere, placing their faith in pre-Nuclear Age solutions which have failed so disastrously in the past, continue the Russian roulette of power politics manufacturing and stockpiling nuclear weapons 2 or three thousand times as destructive as those that destroyed Hiroshima and Nagasaki! The Hibakusha, it would seem, have little reason to love humanity-this is why the world is unable to comprehend their selfless appeal. Indeed, if one talks to individual Hibakusha, one finds very human reactions indeed. Many are filled with bitterness, envy, jealousy of one another, suspicion, distrust and hate. And yet, year after year, there is the incontrovertible fact of their composite testimony. Not only in the official appeals of Hiroshima and Nagasaki, but in hundreds of personal messages which individuals keep sending to the world, there is the recurring theme of concern for all mankind. It doesn't make sense! How can suffering and betrayal, bitterness, suspicion and rivalry, jealousy and hate and distrust add up to forgiveness and a passionate concern for others? The sum is not only greater than its parts; it is of a completely different quality! The only explanation is that, somehow, through their descent into the crucible of agony and their return to a half-life of dread, the Hibakusha, as a group, have emerged with a compassion which defies human reasoning or logic. Perhaps in response to the question that subconsciously torments many of them, "Why should I have been spared?" has come a sense of mission, a compulsion to testify to a Spirit which loves us and requires us to love one another, that forgives us and expects us to forgive one another. One is reminded of a song of praise addressed to the God of Israel, more than 3,000 years ago. "What is man that Thou are mindful of him, or the son of man that Thou doest care for him?" Through the Hibakusha, themselves still suffering and without hope, has been revealed the existence of a power in the universe that does indeed care for man! I have seen human beings, in contact with the Hibakusha, respond to this message with newly awakened hope and dedication, although neither they nor the Hibakusha themselves were aware of the power behind their appeal. Few see the picture whole, in its infinite complexity. Fewer still are even remotely aware of that total which is so much more than the sum of the parts. And none, one assumes, has ever gone away rejoicing, filled with faith and hope-and love. Yet, "faith, hope, and love abide, these three"-ever in Hiroshima. Perhaps-if one can be quiet and listen-especially in Hiroshima. If there can be created here an actual center of peace, an eye of calm in the midst of the storm of human controversy, where the still, small voice of Truth can be heard, Hiroshima may yet show itself to be not an end but a beginning. 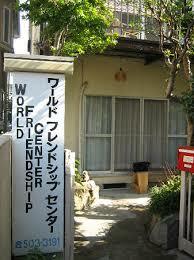 It is in this hope and with the desire to make the twentieth anniversary of Hiroshima's tragedy a true beginning of international cooperation, that the World Friendship Center has been established. Dedicated to a search for truth, through love, the World Friendship Center seeks to be a place where needs and understandings can be gathered together and shared, where people of every country, race, religion, or political persuasion can meet in friendship and with a commitment to listen with respect and goodwill to the opinions of others and where those who come to Hiroshima can join with those who live here in seeking ways to apply and test the Law of Love in this community and in situations of tension and distrust all over the world. Mr. Moritaki, professor of ethics and himself a Hibakusha, has said, "the chain reaction of the spiritual atom can prevail over the chain reaction of the physical atom!" The World Friendship Center, dedicated to tearing down barriers of misunderstanding and distrust and in building bridges across which ideas and ideals can travel back and forth, can be the beginning of such a spiritual chain reaction which will swiftly reach to the ends of the earth. The resultant explosion will shower all mankind with faith and hope and love-the ashes of eternal life.